BADMINTON TBD – likely venue to be in Little Rock at the Jim Dailey Fitness Center (behind War Memorial Stadium). BASKETBALL COMPLETED – March 16 – in Little Rock at the Jim Dailey Fitness Center, at 300 S. Monroe (behind War Memorial Stadium). BOWLING TBD – likely venue to be in Little Rock at the Professor Bowl. CYCLING TBD – likely venue to be in Little Rock at Two Rivers Park. GOLF TBD – likely venue to be in Little Rock at Rebsamen Park Golf Course. HORSESHOES TBD – likely venue to be at UALR track. PICKLEBALL TBD – likely venue to be in Bryant, AR at Bishop Park. 5k POWER WALK TBD – likely venue to be in North Little Rock at the submarine on Riverfront Dr.
5k RACE WALK TBD – likely venue to be in North Little Rock at the submarine on Riverfront Dr.
5K/10K ROAD RACE TBD – likely venue to be – in North Little Rock at the submarine on Riverfront Dr.
SHUFFLEBOARD May 4th – in Little Rock at Brookdale Pleasant Hills Senior Living at 800 Napa Valley Dr.
SOFTBALL TBD. Contact Greg at 501-321-1441 if you have a softball team for 2019 tournament. SWIMMING TBD – likely venue to be in Little Rock at UALR in the Donaghey Student Center pool (25 yards). 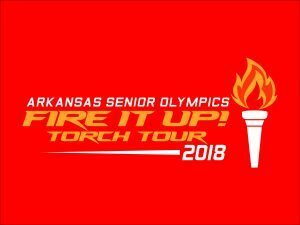 TABLE TENNIS TBD – likely venue to be in Little Rock at Jim Dailey Fitness Center. TENNIS TBD – likely venue to be in Little Rock at Rebsamen Tennis Center. TRACK & FIELD TBD – likely venue to be in Little Rock at UALR, at Coleman Sports Complex. VOLLEYBALL TBD. Contact Greg at 501-321-1441 if you have a volleyball team for 2019 . WEIGHTLIFTING TBD – likely venue to be in Hot Springs at ProFitness on Malvern Ave (behind Shell gas station) .